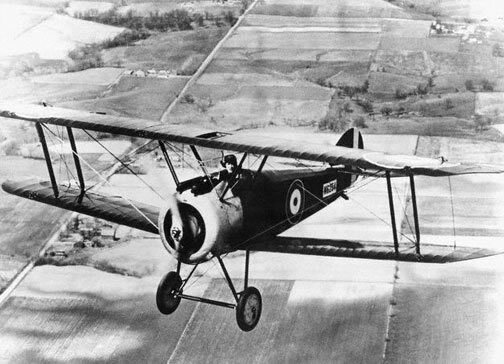 Intended as a replacement for the Sopwith Pup, the Sopwith Camel prototype first flew in December 1916. It was armed with two .303 in (7.7 mm) Vickers machine guns mounted in front of the cockpit, firing forward through the propeller disc. A fairing surrounding the gun installation created a hump that led to the aircraft acquiring the name Camel. The Camel entered squadron service in June 1917. Approximately 5,500 Camels were produced. Unlike the preceding Pup and Triplane, the Camel was not considered pleasant to fly. Nevertheless, its agility in combat made the Sopwith Camel one of the best remembered Allied aircraft of World War I. To its pilots, it was referred to as providing a choice among a "wooden cross, red cross and Victoria Cross." Together with the S.E.5a, the Camel helped to wrest aerial superiority away from the German Albatros scouts. The Camel was credited with shooting down 1,294 enemy aircraft, more than any other Allied scout. Major William Barker's Sopwith Camel (serial no. B6313) became the most successful fighter aircraft in the history of the RAF, shooting down 46 aircraft & balloons from September 1917 to September 1918 in 404 operational hours flying. It was dismantled in October 1918. Barker kept the clock as a memento, although he was asked to return it the following day. By mid-1918, the Camel was approaching obsolesence as a fighter, limited by its slow speed and comparatively poor performance over 12,000 feet. It found a new lease of life as a ground-attack aircraft and infantry support weapon, especially after the German Offensive of March 1918. The Camel remained in service until the Armistice (11 November 1918). This aircraft served with the AFC in 4 Sqn, 5 Sqn, 6 Sqn and 8 Sqn.